Milton Pickett is a most excellent sales associate. He is honest, straightforward, extremely knowledgeable, personable, and very professional. He answered all of our questions, and most importantly, he spent a lot of quality time with us, and gave us a very comprehensive demonstration of all the vehicle features. Kendall Puckett did a great job, too. The Service Dept. Is very good. My rating would have been 5 stars, except that Mr. Boyte allows his inventory to be cheapened by annoying “Bob Boyte” front license plates. When they are removed, there are 2 ugly holes in the front of an otherwise beautiful vehicle. Shame on you, Mr. Boyte! Is your ego that important? Do the Honda people who give you those awards know that you are purposely disfiguring their automobiles ? I have Never had a car buying experience to compare with this one, but I enjoyed it. They made everything so simple and timely on top of being super friendly. This place and its hallowed halls serve as an absolute BEACON of service, strength, and brotherhood. When you walk in, you become one of the immaculate Bob Boyte wolf pack. I was not born on this lot, but as my dying wish I hereby request to be buried there upon my passing. Each and every employee we came in contact with was very friendly and knowledgeable. They did their best to be quick and efficient. 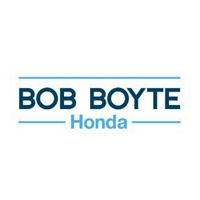 I am very please with the purchase of our daughter's car and will highly recommend Bob Boyt Honda to my friends and family. This was the quickest car buying experience we've ever had! I went in and told them what I needed and they stepped up to plate, they found just what I was looking for and I will go back and purchase again. My experience was great! I came in and talked to Jessica and she listened to what I wanted and made it happen. Very nice and welcoming. We had o good times jest talking to or sale m an.he answered all the questions we had .he show us all we need to know about the car. The professional help from Dan Powell and staff was exceptional and helpful in setting up my new vehicle and in all phases of the purchase.